I’m slowly preparing myself to return to Elder Scrolls Online, which is supposed to be my main MMO again come september. Yesterday, i read Xannziee’s post with a couple of screenshots as well as her impression with ESO (she made a detour through Black Desert for a while). There was an outfit i liked, so i asked her what it was. 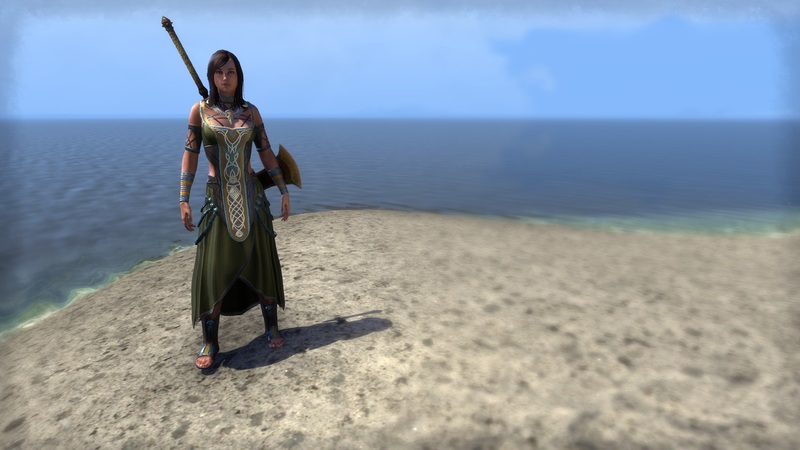 Of course, it turned out to be an outfit from the crown store. 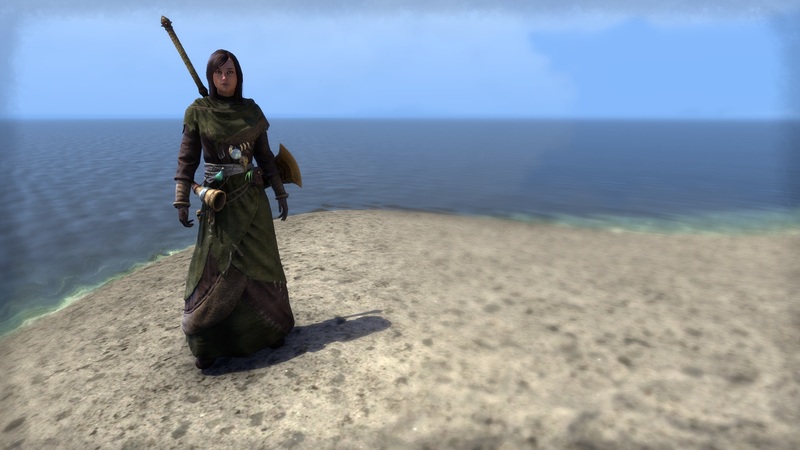 Knowing that a couple of those are going away in a few days, i checked the ESO website if that outfit was among those who are going “out of stock” soon- and it is. So in i went to purchase it. I also had a look at a few of the other items who only remain for three days now, and found another outfit and two sets that interest me. I haven’t decided on the sets yet, but i purchased the solo outfits that interested me. Coincidentally, they seem to be originated in the Valenwood, which is the region i’m questing in since…about forever. I like it because it seems to be fitting to the zone design. It comes in at 1000 Crowns (9€, more on the pricing soon) and lore-wise, these are priest of Y’ffre the storyteller who instituted the “Green Pact”, by which Bosmer are allowed to shape the woods but not harm them (by eating plants or leaving dead meat to rot). Neither me nor my character are especially fond of this pact, but after all, we’ve made an important friend in Greenshade, the Wilderqueen. I’ve read how it was “impossible” that a Nord could join the Dominion willingly (a topic that’s only really important if you’re a lore nerd or roleplayer), but i guess i disagree. I can’t see why a Nord couldn’t be convinced that an Aldmeri Empire would be better for all sentient creatures on Tamriel. We humans know our share of traitors, double-agents, converts and the like, so i can’t really see a problem here. It’s simply a matter of details. So if we were to assume Nuria, my Nord, has somehow joined the Dominion willingly- maybe out of curiosity and a sense of there being ‘something wrong’ with the other alliances, we can also assume that she might dive deeper into the culture of the Dominion. I’m assuming that- after all, i have no other choice, because i created her when ESO launched. I bought this because i liked the look of it, plain and simple. Still, it fits the bigger picture, as well: Treethanes are Bosmeri leaders appointed to oversee a territory- i guess they’re Lords/Ladies or mayors. So, still with the Bosmer. I guess i have earned a place in their nobility by now. I’m still debating about the sets i’m considering- up to three, for 700 Crowns each (but each containing three costumes). So here’s the thing- let’s assume i’m buying those sets, i’d all in all be set back by 4100 Crowns, which would be 31€ (34$, 26 GBP) for 11 outfits. Even if you consider my buying the two outfits only, coming in at 2000 Crowns or 18€ (always assuming you buy the cheapest combination of Crown Packs simply to get those items). While that would be cheaper than in Black Desert Online, it’s still nothing i would spend “real money” on- i’m a subscriber to ESO, so i view these things more as loyalty rewards. I’m fine with all of this, but there’s a trap, of course, where the devs could fall in- i know ESO has a lot of costumes that are earned through gameplay, but with the optional subscription, the creators are tempted to add more stuff to the item store, of course. Playing two subscription MMOs right now (albeit with both offering additional stuff in their shops) i can say this is distracting. Instead of making people play the game, they’re being kept “busy” with the cash shop- “3 days left to buy this, or else…”, converting funny money into real currency, because if you don’t do that, you’re going to spend much more- always convert your spending to real currency and then think about whether something is worth the investment. In World of Warcraft, i can look for a title, an item, a pet or a mount i’d like and i can do a little bit of research on how to get it. In rare cases, it might come from the shop and i’d lose interest- in most cases, it will be in game, and it might require a lot of searching, travelling, killing, looting and hoping for the best- a difficult journey to a goal- all this being the very definition of a Quest. And i can set them for myself. While i am not experienced enough to see if i can set goals for myself in FFXIV, as well (probably possible), i know one thing- i can get it through gameplay, by going out on a quest. As i said, i’m not too bothered- ESO still has a good item shop, the subscription gets even more added value with the ability to dye costumes (for free), so they’re not taking away and they don’t say: “well, it’s basically free for subscribers as you can spend your crown allotment on this ability”, they’re keeping us out of the shop for this thing. It’s not intrusive, it offers nice stuff. I just hope, especially with the prospect of housing coming soon, that they continue to add goals to work towards to into the game…more than “just” provided content, that is. I think ZOS is doing a fantastic job at the moment. The Crown Store is the best item shop i’ve seen in an MMO. It handles great, it doesn’t offer 1000s of items (by rotating them), it’s not too expensive all things considered and not intrusive at all. I just hope they won’t microtransact the hell out of housing 😀 Given their track record, though, i’m quite positive about that.